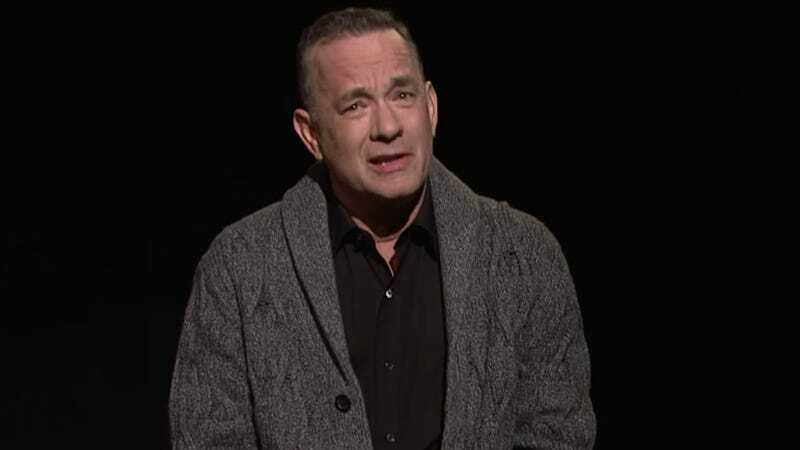 America’s dad is moving into a new neighborhood, as Variety reports Tom Hanks will play Fred “Mister” Rogers in a biopic that’s just been picked up by TriStar. Titled You Are My Friend, the film is based on the real-life friendship between Rogers, who was a minister before he became a children’s TV innovator, and award-winning journalist Tom Junod. Variety says the script, from Micah Fitzerman-Blue and Noah Harpster, tells the story of “a cynical journalist” who only grudgingly accepts writing a profile of the renowned entertainer. Being in Rogers’ proximity transforms said journalist’s “perspective on life,” as well it should since the host and writer taught generations of children about puppets, trolleys, and decency. This new biopic is not to be confused with the one announced a few years back that was intent on focusing on Rogers’ military service. Marielle Heller (Diary Of A Teenage Girl) is directing the film about Rogers, whom she says inspired her: “I can’t wait to bring his story to the public and be a part of such a thoughtful, smart group of people who are all coming together to make this film, which truly feels to me like an antidote to our very fractured culture.” The ever-amiable Hanks is a great pick for the role, as he’s gradually become a voice of reason—or, at the very least, an agreeable distraction—in this topsy-turvy world of ours. Also, we know he looks great in cardigans.